The Building Challenge is aimed at more able, gifted and talented Year 6 children. This is run as an inter-school challenge at Herne Junior School, Owlsmoor Primary School, South Camberley Primary School and Walsh Junior School. Teams of 6 complete with other schools to replicate a building made out of wooden blocks, as quickly and cost effectively as possible. Only two of the team are able to see the original building so must communicate it to the rest of their team who have responsibility for buying the bricks, building and tracking costs. This is a challenge that involves strategy, communication, memory, leadership and most importantly; teamwork. A representative from the construction industry will introduce the event and give pupils and overview and introduce some of the different roles within the industry. This is an annual challenge, please email jane.sheridan@ed2biz.co.uk for 2017-2018 dates and more details. If there's not a challenge run in your local area and you would be interested in hosting one - please get in touch. An all ability challenge for Year 5 or Year 6 pupils. This challenge is suitable for whole year groups (maximum 90 pupils) or run as an inter-school competition. This challenge is introduced by a civil or structural engineer. They will give a brief overview of engineering as well as some information about bridges and some of the associated forces. Pupils work in teams of 6 to build a bridge using paper rods, nuts and bolts. The bridge will need to meet a brief (a specified height, width and load bearing). The engineer will judge the bridges and talk to pupils about their bridges before the winners are announced with certificates and a small prize for Strongest, Most Creative and Best Overall. The challenge fits into a school morning with a break to accommodate normal break times and finished by 11.45am to allow for the hall to be set up for lunch. please note for schools outside of a 20 mile radius of GU12, the cost is £6 per pupil. Students work in groups of 10 to take part in a 30 minute workshop which showcases their business or organisation. The students rotate around and take part in four activities. Organisations range from colleges and universities to public sector to private sector local and national businesses. Each will deliver a 30 minute hands-on/interactive activity to demonstrate an area of science, technology, engineering or maths. Costs: Dependent on the activities required / number of pupils. A fantastic opportunity for pupils to have fun solving a series of puzzles and maths problems. Designed by the Liverpool Mathematical Society, there are sets to designed to suit all different age groups. Each session runs for around an 50 mins/hour (depending on the school day) with groups of up to 60 pupils. Pupils work in pairs to solve the problem which is checked by a teacher or business ambassador (using an answer sheet) before they move onto the next puzzle. This is a great event for increasing confidence in pupils and making maths fun. Costs: £400 - £550 for a full day (4 - 5 sessions) depending on numbers and distance. The three bears return home to find Goldilocks in Baby Bear's house but she's denying that it was her who broke the chair or ate the porridge. Pupils look at evidence gathered by the Forest Police including paw prints, hair samples, bite marks and a chair reconstruction to try and work out if it was Goldilocks or if it might have been another of the forest’s inhabitants. 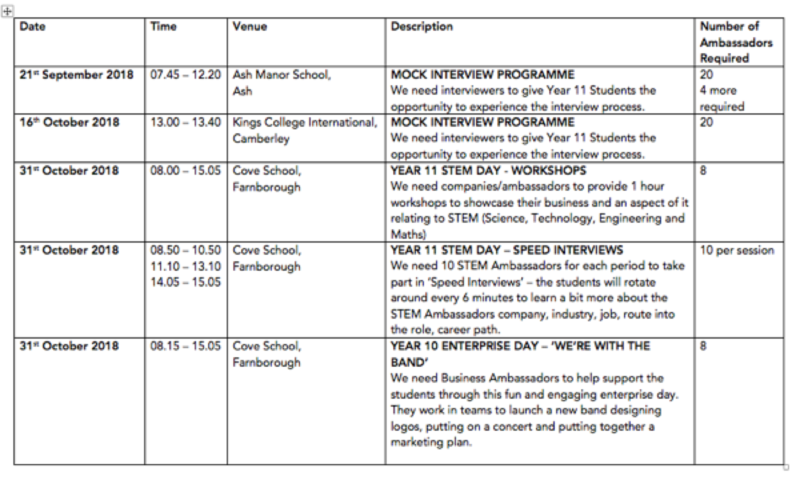 We'll invite 4 or 5 representatives from business along to your school. Pupils will be invited to ask each of the guests questions they have previously prepared to see if they can work out what job each representative does.